How Does Teeth In One Day Help With Keeping Jawbone Health Positive? Losing teeth can cause all sorts of problems when it comes to the functionality of your bite and your ability to eat, as well as to the aesthetics of your smile. What many people do not realize is that edentulous can also cause long term damage to the jawbone too. Why Does Tooth Loss Cause Jawbone Damage? 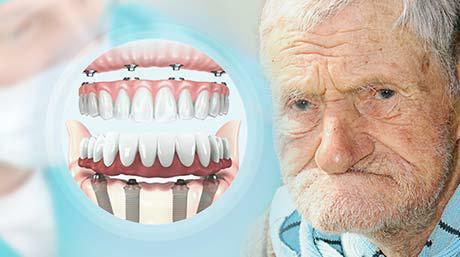 When you lose one or more teeth and especially if you are approaching edentulous, the jawbone can start to deteriorate. This is due to the under-stimulation of the bone tissue, which needs to be used in order to maintain its form and function. The alveolar is the bone that surrounds your teeth, and anchors them in the mouth. Usually the necessary stimulation comes from the teeth themselves, when you bite and chew but when you lose a tooth this does not occur, and alveolar begins to deteriorate. Simply put, you do not use your jaw and so it stops working. After a while even the tougher basal bone in the jaw can begin to wear away. The more teeth you have missing the more your jawbone is likely to be affected. If this worsens it can lead to changes in the shape of your face, problems with remaining teeth, difficulty chewing, and difficulty talking. What Dental Procedure Keeps Jawbones Healthy? There are a few options available for people who have lost or are losing their teeth. The main ones to consider are dentures, which are a functioning set of removable teeth, and dental implants. While dentures are a valid and cost effective option, dental implants more closely mimic the structure and functionality of your real teeth, and therefore provide solid support for the jaw. Dental implants are screw-like fixtures that are made from titanium, and fuse to the bone of your jaw in a process known as osseointegration. The bone cells in your jaw lock in to the implants, and the replacement teeth are fixed on. This provides a structure that is very similar to your natural teeth, which in turn stimulates the jaw and encourages it to remain functional and well formed. Dental implants preserve the bone and leave you with great jawbone health. What Makes Teeth In One Day Superior For Jawbone Health? Standard multiple tooth dental implants do help to secure the jawbone and encourage the bone tissue stimulation that is needed for the continued proper functioning. However, standard implants are not always easy to implement. A patient who already has weak bones may not be able to have the procedure without needing a bone grafting operation, which can be costly and require a lot of operation time. The Teeth In One Day dental implants provide the greatest level of jawbone structure and integrity possible, while requiring only 4 implants for a full arch of teeth; meaning less procedure time and costs. The advanced method also allows you to have the implants without the need for bone grafting. The back implants are angled at 45 degrees, allowing the implants to be longer, and to be positioned in the stronger anterior bone, rather than the posterior when the bone can be damaged. This also increases the contact between the implant and the bone, making osseointegration more effective. The Teeth In One Day dental implants provide the greatest level of jaw structure, all with a minimally invasive treatment. Teeth In One Day dental implants provide support and structure for your jawbone, and keep it as active as it would be with natural teeth, minimizing its resorption (damage). Keep jaw functioning well for proper bite and easy talking. Keep facial structure well supported for a beautiful smile. Stop skin from wrinkling around mouth. Prevent distortion of facial features. Natural looking jawline and teeth. Some dentists and all prosthodontists can carry out dental implant surgery. Prosthodontists are extensively trained in cosmetic dentistry and are your best call of action if you want help with tooth loss and edentulous. 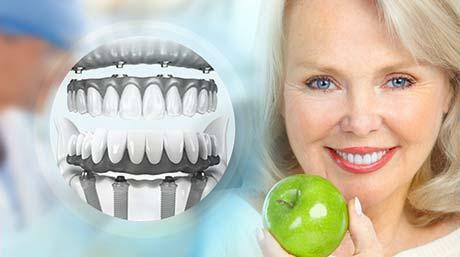 At Friedman Dental Group we specialize in the Teeth In One Day dental implant procedure. You can arrange a free consultation with us to find out more, Teeth In One Day dental implants can save your jaw from deterioration. Contact us today to arrange an appointment to regain your jawbone health.